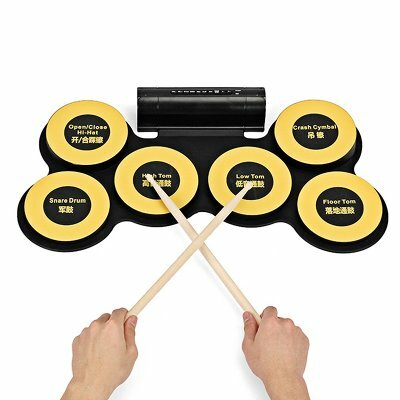 Successfully Added Electronic Drum Pad - 6 Drum Pads, 2 Foot Pedals, USB Port, Earphone Jack, Self-recording, Portable Design to your Shopping Cart. Electonic drum great for the entertainment of the whole family. Moreover, the drum comes with 2 quality stereo speakers. When you connect the drum with speakers you can create exceptional music experience for everyone. With the audio input interface, you can practice any song of your choice. The external earphones enable you to play the drum without disturbing those around you, great for practiciing whatever time of day it is. This Electronic drum is a great choice for entertaining a small gathering. You can produce a sound that is more bright and upbeat. It features a DC 5V USB port through which you can easily charge the drum. It has 7 tones, 12 songs and 9 rhythms with a built-in metronome. This electronic drum enables you to play any kind of music. It is a great way to teach kids about music and drum. All you have to do is plug it in and start playing the drum right away. Whether you are into a rock or pop music, with this drum you can start your journey to becoming a real-life rock star. The package includes a pair of foot pedals, a user instruction, a pair of drumsticks, a charging cable, a CD, an audio cable, and a charging power supply. This electronic drum pad comes with a 12 months warranty. Brought to you by the leader in electronic devices as well as wholesale electronic instruments and gadgets.